If you’re facing down a gift list with a lot of vino-heads on it, it’s always fun to buy wine and there is no shortage of ways to do it. If you want something that will last a little longer, books about wine are always fun to receive. Here’s a run-down on some of the ones that have caught my eye this year. There’s really something for everyone. I have to recommend the beautiful, substantial Winemakers of Paso Robles with photographs by Julia Perez and words by Paul Hodgins. This book will set you back a chunk (it retails for about $100) but it’s a luxe, rich, saturated look at the people who make wine in the increasingly vibrant AVA of Paso Robles, CA. It’s heavy on human portraits and relationships to the craft of winemaking; this one’s not a wine encyclopedia and it’s more about people than grapes. It’s a beauty, and if you know someone who likes to have the inside scoop on the folks that make wine, this is a great inside look and it’s very visually arresting. The Dirty Guide to Wine by Alice Feiring with Pascaline Lepeltier (Countryman Press). Lots of books guide you through the wine world according to grape type, or region. This one looks at the actual ground the grapes grow in. Ever wondered what “terroir” really is? It has a lot to do with dirt, and the same wine made by the same method will taste different if it comes from an igneous rock area versus sedimentary, for example. This is a great book for the know-it-all in your life-it’s an accessible and affable look at how geology influences what you taste when you open a bottle of wine. It gives tons of specific examples and it isn’t impossibly dense. Adventures with Old Vines: A Beginner’s Guide to Being a Wine Connoisseur , by Richard L. Chilton Jr. (Rowman and Littlefield). Do you have someone on your gift list who… well, how can I put this? Who has to sound in-the-know about everything? This is an excellent instruction manual for that person. Chilton owns Hourglass Vineyard in Napa Valley and let’s just say he has done his homework. This book has a certain tendency to present personal opinions as empirical facts, but the opinions are not radical or weird; it’s a very solid guide to “what’s really good, and why” and is a terrific choice if you or someone you know is planning an oeno-tourismo type trip to, say, France. It gives you tons of details on where to go and what to drink, and you’ll pick up the knack of acting Ultra Knowledgeable about the Good Stuff. Around the World in Eighty Wines by Mike Veseth (Rowman and Littlefield). This follows the path of Jules Verne’s Around the World in Eighty Days, picking up a glass in each of the 80 locations. A breezy, easy to follow sampler of wines from… well, everywhere, including Shangri-la, this book has a good sense of humor and a wide-ranging, bird’s-eye perspective. It will digress into history, marketing, economics, culture, politics and religion and take you right along with it. A really fun and engaging read that will make you want to start planning an 80-wine whistle-stop tour of your own. 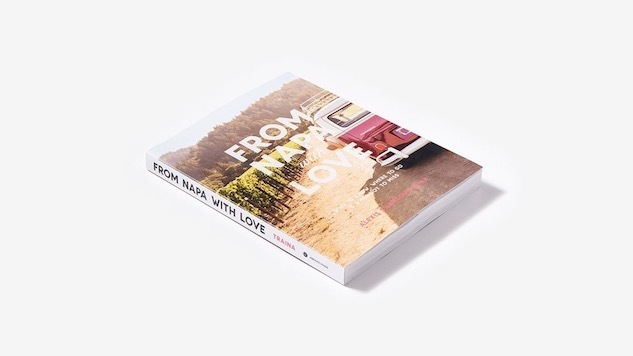 From Napa With Love by Alexis Swanson Traina (Abramis). This book is stylish, pretty, detailed, and wantonly name-dropping. If your gift-target is headed for California (or wishes she were) this book is a treasure trove of info on what to do, where to go, what to eat and what to buy in the Napa Valley. It’s not the book for the grape geek on your list, let’s be super clear there. This book’s intended audience is bon vivants on a mission to consume the best of the best in Northern California. If you want to know where Thomas Keller likes to eat or where Ann Colgin gets her jewelry, this is your book. If you want to know the it-spots for mud baths, antiquing, winetasting; where to find the fetish-inducing bakeries or most scenic backroads-this is your book. It’s not an intellectual heavyweight but not everything has to be. And it’s lots of fun. Tangled Vines by Frances Dinkelspiel (St. Martin’s Press). Like most niche worlds, the wine world has a weird, weird shadow side. This book is a vivid exploration of the crazy early years of the California wine industry and a bizarre arson case that destroyed $250M worth of fine wine in 2005. There’s a dark, egomaniacal, obsessive, and even bloody side to the world of wine collecting. Tangled Vines delves into the heart of it. It’s a fascinating read. I’m still rooting for Karen MacNeil’s Wine Bible (Workman) as the best fusion of wine information and entertainment to come out in recent years. It’s a keeper and has won a ton of awards for a reason. MacNeil’s a wordsmith and just plain fascinating, and this book will remain a classic. It’s instructive, it’s beautiful, it’s comprehensive, it’s personable and it’s just plain great.